I like Stack Exchange Chat, and with the feedbots it tends to be pretty easy to keep up with what's going on with the site. Except for one thing - my inbox. 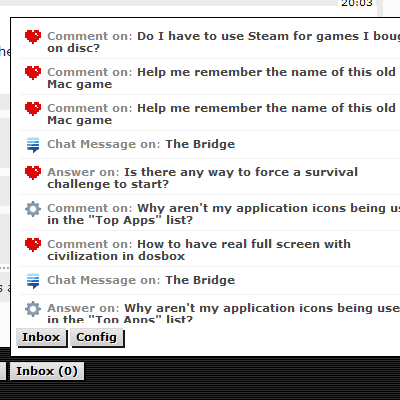 So I wrote this UserScript that adds an "inbox" button with auto-refresh to the chat interface. To install, visit the ChatterBox home page. The script refreshes your inbox every minute, and shows new items at the top of the list. The current maximum items that will be displayed is 10. Click the "inbox" button to toggle display of your inbox, and click "Inbox Cfg" to set relevant options (right now, just your access token). You'll need an access token to use it, which you can get from the home page. Also, the link to get access tokens is in the "config" popup. Once you generate a token, push the "Inbox Cfg" button, put the code in the input field, and hit save. You can then close the configuration window by pressing "Inbox Cfg" or switch to the inbox view by pressing "Inbox." The number in the "Inbox" button is the number of unread items you have in your Stack Exchange Inbox. This has been tested in the latest release versions of Chrome and Firefox. I'm not doing anything crazy that should be browser specific, so it ought to work in most sane UserScript implementations. Please feel free to report bugs. Me; You can usually find me on Stack Apps Chat. I stole some "injection" code from SE Chat Modifications, but otherwise I used this as a way to learn more about user scripts. Hopefully it isn't too terrible for my first time out. Suggestions are, of course, welcome. Code is available in this GitHub repository (see the directory "seci"). The "inbox item body" is now shown alongside the title of the post. I released a second version today, which has a much "fancier" style, similar to the Stack Exchange SuperCollider Inbox. Thanks goes to Ronan Forman for suggesting this. Not the answer you're looking for? Browse other questions tagged script api-v2 chat .